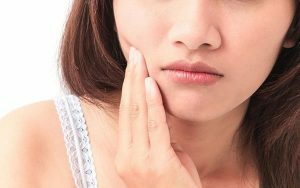 Do your teeth ache whenever they are in contact with hot or cold food/drinks? If so, it is highly likely that you have sensitive teeth. Tooth sensitivity is a common dental problem with about 20% of Australians buying special toothpastes made to target it. Tooth sensitivity requires a thorough checkup as it can be an indication of a more serious dental problem in your mouth. At Ria Family Dental, we take everything seriously. If you think you have sensitive teeth, see us right away for help. Your trusted Yeronga dentist will help you shoo the pain away for good. The dental pulp is found inside the tooth and is composed of nerves and connective tissues. The tooth’s nerve functions like a sensory organ that reacts to temperature changes. Some of the abovementioned dental problems can worsen if left untreated. For instance, gum disease can progress to periodontal disease, which can’t be treated. Scheduling an appointment is the best way to deal with a sensitive tooth. As with most of our treatment process, determining what caused your tooth sensitivity is important. The cause has to be treated to stop it from worsening, and stop the pain once and for all. For example, if the cause is poor dental hygiene with your teeth showing signs of decay, a professional clean is recommended along with a strict oral hygiene program and follow up checkups. If the damage is on the dental pulp, a root canal treatment may be recommended to save the tooth from extraction. We rarely recommend an extraction as the consequences of missing tooth can only pose more dangers to your oral health. We at Ria Family Dental believe in the importance of preventative dentistry. We educate our patients on the ways they can take care of their teeth even in the comfort of their own homes. Brush your teeth after every meal or at least twice a day – one in the morning and one before you sleep. Floss and rinse at least once a day. Eat mouth-friendly foods. Moderate intake of foods that easily stain the stain such as berries, for whiter teeth. Schedule a regular checkup with your dentist. At Ria Family Dental, anything that compromises your oral health is our concern. From simple to complicated dental needs, you can completely trust us.